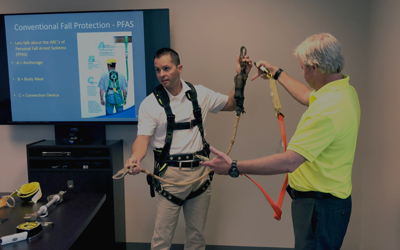 Mock OSHA Inspections are a necessary part of any safety program. CORE’s team of experts act as inspectors, helping businesses and facilities maintain compliance with OSHA and other regulations and providing insight into the level at which an organization’s safety programs are being executed. A Mock OSHA Inspection is a good idea for businesses and organizations looking for an evaluation of their level of compliance with OSHA health and safety standards. CORE teams serve manufacturing operations, shipping/receiving and warehouse operations, assembly sites, chemical processing, service industries, maintenance facilities, laboratories, and medical or dental operations located anywhere in the United States. CORE Safety’s team is well-versed on the current OSHA regulations and requirements and can act as inspectors to assure that a workplace is maintaining compliance with current OSHA requirements. Our inspectors provide clients with thorough reports of potential violations and areas for improvement to help employers and workers reduce hazards and maintain safe and efficient workplaces. One of OSHA’s primary functions, in their mission to assure safe and healthy working conditions, is to set safety standards then verify compliance through work-site inspections (mostly unannounced). If your business is found out-of-compliance, it could be facing serious fines and other consequences that negatively impact your bottom line. OSHA Readiness Inspections help employers close the gaps in their compliance programs, and offer piece of mind if/when the inspector knocks on the door.